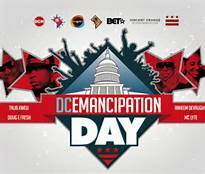 Emancipation Day is the only official holiday in the District of Columbia to mark the anniversary of the signing of the Compensated Emancipation Act, which president Abraham Lincoln signed on April 16, 1862. It is in commemoration of Lincoln buying all 3,400 slaves in the District in 1862. It is the only compensated emancipation in US history. He did this as a prelude to the Emancipation Proclamation which came 9 months later. A wide range of events are arranged in Washington DC to mark Emancipation Day. These are spread throughout the month of April and include exhibitions, public discussions, presentations of historic documents, the laying of wreaths, concerts and poetry readings. The events aim to educate a broad spectrum of people about the history of the municipality of the District of Columbia in general and slavery in particular. Attention is also paid to the African origin of many slaves and racial issues in modern American society. Emancipation Day is the only official holiday in the District of Columbia to mark the anniversary of the signing of the Compensated Emancipation Act, which president Abraham Lincoln signed on April 16, 1862. It is in commemoration of Lincoln buying all 3,400 slaves in the District in 1862. It's the only compensated emancipation in US history. He did this as a prelude to the Emancipation Proclamation which came 9 months later.